Home Auto 2019 Honda Civic Sport Coupe: New Model Offers Affordable thrills. 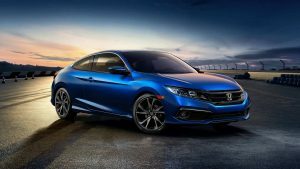 There is a new addition to the Coupe lineup: the 2019 Honda Civic Coupe. Priced a few grand up from the base LX coupe, the Sport offers a few changes, and value for money for those looking for a little bit more. The Sport offers a new lower-grille setup, featuring new chrome accents to the lower side pods. The new trim adds a piano black lower front fascia and side pod accents on both sedan and hatchback body styles. The hatchback receives a rear subtle decklid spoiler and exhaust finisher. Like the SI, the Sport receives 18-inch, 10-spoke wheels in a black finish. The Sport is priced at $24,590. Interior upgrades from the LX include: aluminum trimmed sport pedals, proximity key with pushbutton start, steering wheel –mounted paddle shifters (CVT), and dual zone automatic climate control with air filtration system. There is us also a one touch power sunroof with tilt feature. Under the hood is a 2.0-liter four-cylinder engine with i-VTEC technology paired with either a continuously variable transmission or a six-speed manual gearbox. Inside, both the sedan and coupe Sport receive a seven-inch infotainment system with Android Auto and Apple CarPlay, and a proper volume button. The front-end offers halogen foglights. The new Sport trim, neatly bridges the gap between the standard coupe and the higher model Honda Coupes. In addition to standard features such as a reversing camera and a full array of front and side airbags, the Civic offers a suite of driver assistance features as standard equipment. The collection of features, called Honda Sensing, The Sports interior cabin adds black leatherette and cloth trimmed sport seats. There is also a leather- wrapped steering wheel, on the road, the Honda Sports chassis and handling are superbly engineered and offer excellent on-road dynamics, making the Sport agile and fun to drive. The Sport is a wonderful car to drive, you sit firmly wrapped in the deeply supportive sport seats and everything falls to the hand and feet with the excellent ergonomics. In closing, the Sport comes across as an affordable sporty car that offers a mix of satisfying driving and ownership. Downsides are few, it seats four in comfort, five at a push. Highly recommend if affordable performance is what you need.